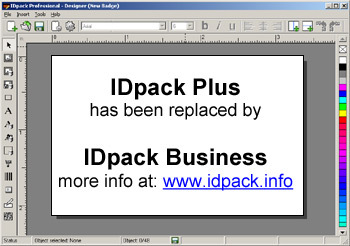 IDpack Plus is a fast and reliable badge-printing program for Windows. It allows you to design and produce photo ID cards, badges, labels and nametags for all kinds of uses: employees, schools, libraries, membership, corporate security cards, convention cards and all other needs. There is no need to buy expensive ID card-making equipment or PVC cards, IDpack prints on your own printer with more than 1000 Avery label formats built in or 40 DYMO LabelWriter formats. The program consists of a badge designer and a producer. IDpack Designer allows you to customize your badges with text, barcodes, logos, pictures and more. IDpack Designer can be optionally installed on a server, so that other clients can connect to it from a network. The Producer has a digital picture capability via camera input, imported pictures, barcode reading and more.